I awoke this morning at the usual 5 a.m. I gently put my NxStage System One in rinseback mode and then once the blood had made its way back into my body, removed the needles and disposed off all the used up consumables. It was a cold morning. I was wondering whether I should put on a sweater but then decided against it. I made my way to the kitchen and put the water to boil. I decided to have the Rohini Premium Black Darjeeling this morning. One and a half teaspoons. Five minutes to brew. 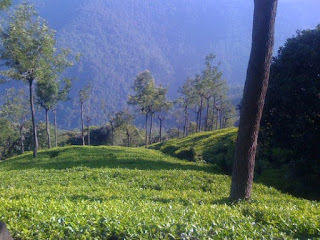 I chuckled to myself thinking about the irony of having Darjeeling tea in the midst of the Nilgiris! I took my steaming cup and went towards the backyard. I opened the door from my living room and took out my easy chair and placed it on the platform just above the grass. I settled in with my cup. I could see the moist air emanate from my mouth as I breathed out. I could actually feel the sips of tea going down all the way from my tongue through my throat and then right down my gullet, invigorating and warming my entire body. What would I do if there was no tea in my life? I then did my usual ten-minute meditation routine and then wrote for about an hour. I had started writing this book within a week of moving to Coonoor. In the past three months, I had completed about half the story. As the sun started rising, I realised I had begun to feel a little hungry. I had some cornflakes and then got ready and went to the community swimming pool. The heated pool in this part of town was absolute bliss. About 40 minutes of swimming and I was feeling so nice. The best part of the pool was a waterfall at one end where you had hot water gushing with force on your head. I came back home and had a breakfast of Idlis. I then headed to the Coonoor NephroPlus centre. I checked on all the guests who had come in for dialysis, had a Skype call with the centres scheduled for today and then got about my daily emails and other tasks for the day. We were planning to submit four abstracts for the upcoming World Congress of Nephrology and the data was coming along just fine. I caught up with my Hyderabad team on some stuff and then went back home. Traditional Gujju lunch and a nap later, another cup of Darjeeling black and then back to my book. Fiction gives you so much freedom. You give your characters the traits you want to, no restrictions imposed by actual people! You make things happen. You add a twist where you like to. No constraints! I am excited thinking about what the response would be! Of course, it may turn out to be a dud. But I wouldn't mind. I enjoyed the journey. By around 6 p.m., I began to feel tired. My mind was exhausted. I munched on some berries. How I loved berries, in all colours and sizes. Not that I needed to watch my potassium since I was on daily dialysis but they did have low potassium. If there was one thing I missed when I was in Hyderabad it was berries. I watched some television. Modi was in the thick of campaigning for the 2019 election. I wondered if he would win. I think he did a good job overall. But was he as good as people thought he would be? That may be up for debate. A light dinner followed. Some fresh bread with herbs and butter, homemade pizza - only Margherita (toppings were still overrated). I went through my Pocket and Flipboard apps and read some good articles. I was soon back beside my companion for the night - my faithful NxStage machine. I was so grateful that I had access to this beauty. Just a few years ago, I had honestly no hope of being able to get one. But then suddenly it all changed. Indian health-care became dramatically different. It brought access to the latest and the best. With it, came the little NxStage machine. The lesson for me from all this was - never give up hope. These thoughts lulled me into deep sleep in a few minutes. Is NxStage System One available in India? What is the price and your operating costs? No sir. Not yet available. This post was my hope for a future day.